Mitigation: Wherever and whenever possible, CSA should help to reduce and/or remove greenhouse gas (GHG) emissions. This implies that we reduce emissions for each calorie or kilo of food, fibre and fuel that we produce. That we avoid deforestation from agriculture. And that we manage soils and trees in ways that maximizes their potential to acts as carbon sinks and absorb CO2 from the atmosphere. CSA integrates multiple goals and manages trade-offs: Ideally, CSA produces triple-win outcomes: increased productivity, enhanced resilience and reduced emissions. But often it is not possible to achieve all three. Frequently, when it comes time to implement CSA, trade-offs must be made. This requires us to identify synergies and weigh the costs and benefits of different options based on stakeholder objectives identified through participatory approaches (see figure 1). CSA maintains ecosystems services: Ecosystems provide farmers with essential services, including clean air, water, food and materials. It is imperative that CSA interventions do not contribute to their degradation. Thus, CSA adopts a landscape approach that builds upon the principles of sustainable agriculture but goes beyond the narrow sectoral approaches that result in uncoordinated and competing land uses, to integrated planning and management (FAO 2012b; 5 FAO 2013a 2). CSA has multiple entry points at different levels: CSA should not be perceived as a set of practices and technologies. It has multiple entry points, ranging from the development of technologies and practices to the elaboration of climate change models and scenarios, information technologies, insurance schemes, value chains and the strengthening of institutional and political enabling environments. As such, it goes beyond single technologies at the farm level and includes the integration of multiple interventions at the food system, landscape, value chain or policy level. CSA is context specific: What is climate-smart in one-place may not be climate-smart in another, and no interventions are climate-smart everywhere or every time. Interventions must take into account how different elements interact at the landscape level, within or among ecosystems and as a part of different institutional arrangements and political realities. The fact that CSA often strives to reach multiple objectives at the system level makes it particularly difficult to transfer experiences from one context to another. CSA engages women and marginalised groups: To achieve food security goals and enhance resilience, CSA approaches must involve the poorest and most vulnerable groups. These groups often live on marginal lands which are most vulnerable to climate events like drought and floods. They are, thus, most likely to be affected by climate change. Gender is another central aspect of CSA. Women typically have less access and legal right to the land which they farm, or to other productive and economic resources which could help build their adaptive capacity to cope with events like droughts and floods (Huyer et al. 2015). 6 CSA strives to involve all local, regional and national stakeholders in decision-making. Only by doing so, is it possible to identify the most appropriate interventions and form the partnerships and alliances needed to enable sustainable development. 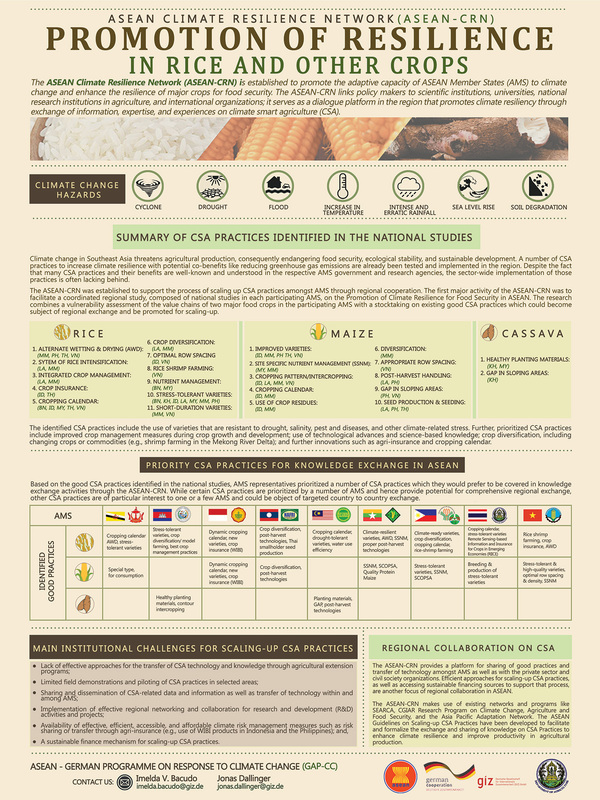 The ASEAN-CRN supports the process of scaling up CSA practices amongst AMS through regional cooperation. The first major activity of the ASEAN-CRN was to facilitate a coordinated regional study, composed of national studies in each participating AMS on the Promotion of Climate Resilience for Food Security in ASEAN. The research combines a vulnerability assessment of the value chains of two major food crops in the participating AMS with a stocktaking on existing good CSA practices which could become subject of regional exchange and be promoted for scaling-up. The identified CSA practices include the use of varieties that are resistant to drought, salinity, pest and diseases, and other climate-related stress. Further, prioritized CSA practices include improved crop management measures during crop growth and development; use of technological advances and science-based knowledge; crop diversification, including changing crops or commodities (e.g. shrimp farming in the Mekong River Delta); and further innovations such as agri-insurance and cropping calendar.